This article applies to both “stationary” yoga teachers (like most of us) AND yoga teachers who’d like to take their yoga biz on the road. Go through Yoga Teacher Training —> Quit your day job —> Travel the world and teach yoga. While it’s true that technology (Skype, WIFI everywhere, etc.) has made this lifestyle easier than every before… it’s certainly not as easy as it appears on Instagram. We’ve all seen the perfectly curated picture of a young person working via laptop on the beach. We’ve personally been through this transition and lived to tell about it. 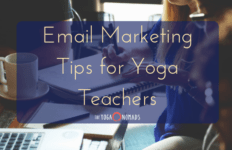 If you want to succeed as a yoga teacher their are some crucial steps to take before hitting the road… such as creating an online presence. And not just a few social media pages that you randomly post to. We’re talking about taking this online thing seriously. Committing time and energy to learning some new skills and expanding your impact as a yoga entrepreneur. The first step is creating a website. If you haven’t already, be sure to download our Beginner’s guide to creating a website. 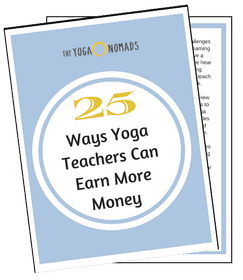 Join over 5,000 yoga teachers. 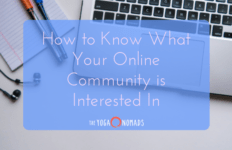 Before we get into the strategies for taking your yoga biz online… let’s address an important question – WHY go online in the first place? Location independence – live wherever you want and work remotely! Reach a wider market with your message – it’s a global market! Assist with marketing your premium offerings – like retreats and workshops! Increase income with another revenue stream – who wouldn’t want another revenue stream…? It’s no secret that technology plays a major role in our society and the way we live our lives. Nearly all professions are able to take some aspect of their business virtual. Some do it to reach more clients, save/make money, and some go online so they can work remotely. 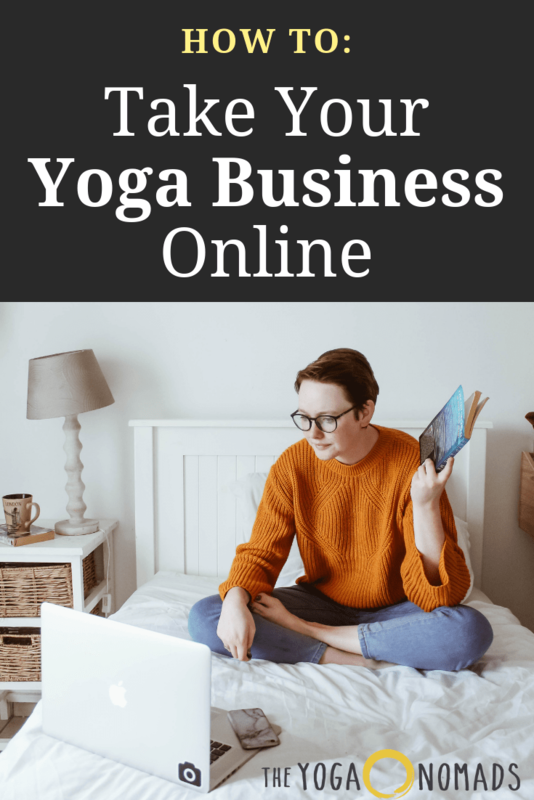 There are endless reasons to take some or all of your business online, and we’re here to share with you how to do it in your yoga business. Have a website – acts as their home base for everything yoga and business related. When used effectively, websites are 24/7 marketing machines. Never stop learning – consistently attending workshops and trainings to learn, devouring books, podcasts, and online courses. As an entrepreneur, it’s important to learn new skills to compliment your business and life! We understand that not all yogis are created equal… and that technology will come more naturally to some than to others. 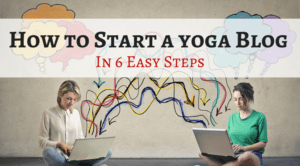 We’ve developed lots of content to help you get over the technology hump in an effort to make you feel more comfortable as you accelerate your yoga business. Whether you choose to stay in one place, or travel the world, here are 5 ways to take your yoga business virtual. 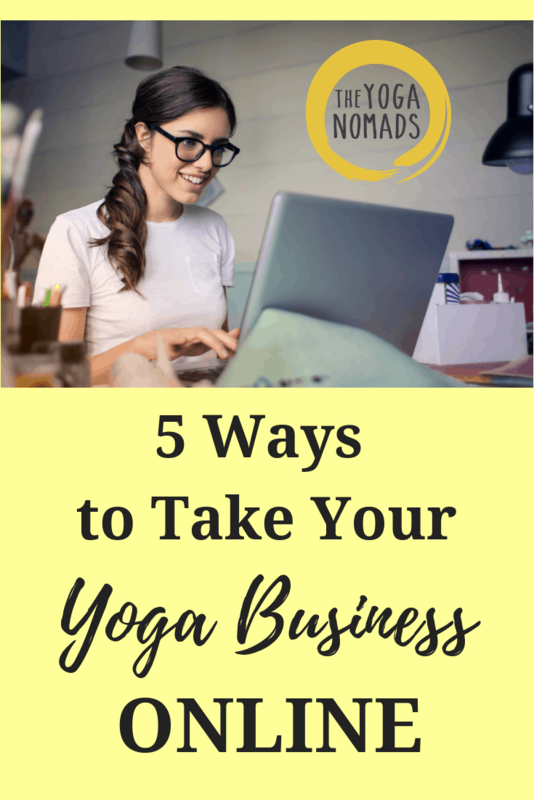 Your website is the foundation of your yoga business. Consider it your homebase. It’s your 24/7 marketing machine. 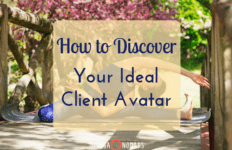 Your website showcases your unique style, your credentials, class schedule, your offerings, and you can even process payments for your workshops/privates/retreats/etc. Pro-Tip: Get started now. 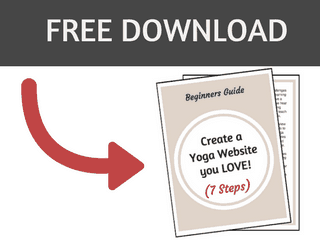 It’s never too late to build your yoga website. The sooner you start, the sooner new opportunities will become available! Choose a couple of platforms and learn them in and out. For yoga teachers FB, Instagram, and Pinterest are still king. If you spend time on the socials, be sure to post when your followers are most active to maximize the engagement. Word of caution: Don’t put all your eggs in the social media basket… social media algorithms change constantly which means one day your strategy is working and the next all you hear is crickets. Read more about the downfalls of social media here. Pro-Tip: Video is hot on social media right now, especially “live video.” I know it’s scary to start, but you’ll be rewarded with a serious boost in engagement. Make a plan and test it out. Go LIVE, create a story, shoot a timelapse. Email marketing is arguably the most important aspect of your business. It’s the easiest way to build trust with your readers and stay connected with them consistently. Your newsletter is the perfect format to solve your ideal client’s problems and you can even drive traffic back to your website/offerings! Email marketing tools (like Mailchimp or Drip) offer statistics of what’s working and what’s not working. Pay attention to these analytics so you can continually improve your email marketing. 🙂 If you ever plan to offer a premium service (you should), email marketing is the most effective way to turn casual students into paying clients. Pro-Tip: Offer a free-gift (lead magnet) in exchange for someone joining your email list. 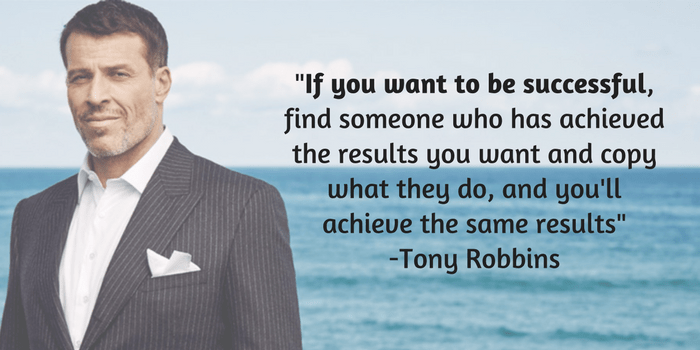 Studies show that having a lead-magnet will increase the percentage of people who will join your list. The marriage of yoga and the internet has produced some pretty cool offspring…including virtual classes. 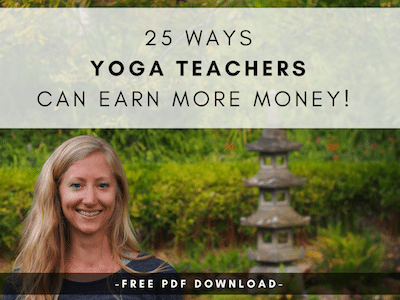 Putting your yoga classes online is one way to diversify your income as a yoga teacher, but also a way to reach global yogis. Whether you’re a traveling yogi or not, housing classes online can also help you market yourself as a yoga teacher. Pro-Tip: If you’re just getting started filming your classes, we recommend listing your classes on one of the online platforms. By leveraging their user base, you’ll see more viewers than if you hosted the video classes on your own site 🙂 Check out Cody, Udemy, and Namastream. What is your greatest gift/skill? What do other people want to learn from you? Would you enjoy teaching others? Consider offering your knowledge in an online course format. Perhaps you are really great at social media for yoga teachers. Or maybe you’re an anatomy boss and instead of offering in-person workshops, you could create a digital workshop! Online courses are a great way to spread your message around the globe (instead of being limited to the city you live in). Pro-Tip: Online courses are a great business model – you create some amazing once and then you can sell it for years to come. Just be sure to update your content as things change. 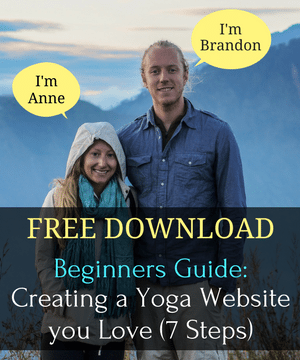 Brandon and I created an online course called Create Beautiful Yoga Websites. 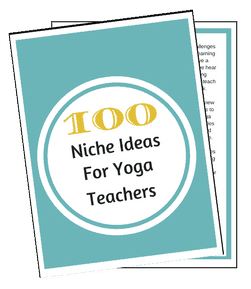 We help yoga teachers create their own website and learn how to market themselves online. We spent over a year creating this baby and we’re proud to say our students are getting amazing results! Click here to be the first to know when we open the course up for new students. 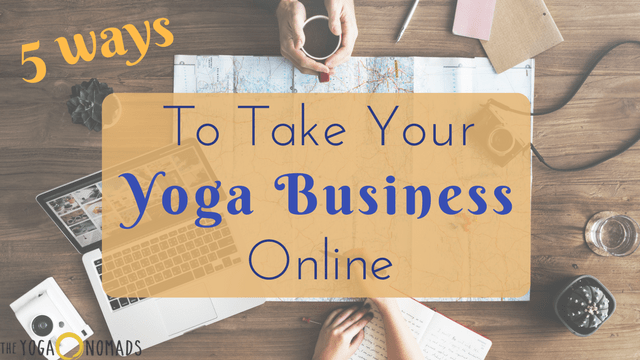 Alright, I’m convinced I should take my yoga business online – but where do I start? In this beginners guide, we’ll walk you through everything step by step. No tech experience required and you won’t need to hire an expensive designer!